As the who’s who of Australian golf prepare to gather for the inaugural Greg Norman Medal on the 1st of December at RACV Royal Pines Resort on the Gold Coast, the PGA of Australia has released the list of nominees who are in line for Australian golf’s most prestigious award. 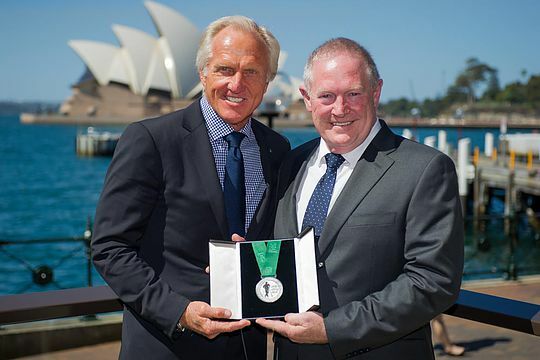 The Greg Norman Medal will be presented to the best male or female Professional golfer on the world stage in 2015, with eight nominees selected by a five-member panel – Adam Scott, Jason Day, Matt Jones, Marc Leishman, Steve Bowditch, Minjee Lee, Rebecca Artis and Karrie Webb. PGA Vice Chairman Peter O’Malley, PGA Director Michael Long, PGA Life Member, former Open Champion and Australian Olympic Golf Team Leader Ian Baker-Finch, PGA Life Member and former PGA TOUR winner Graham Marsh and ALPG legend, Jane Crafter have selected the following Professionals for this year’s award. Greg Norman provided input during the selection process of each nominee. The winner will be determined based on annual success on the Australian and International stage across all Professional tours. The evening will also see five national awards given honouring Vocational and Tournament Professionals, both male and female, and will celebrate all aspects of Professional golf in Australia showcasing their domestic achievements. Queenslander Adam Scott played a more limited schedule than most players in 2015 however from his 16 starts on the PGA TOUR he recorded four top-10 finishes. Scott continues to show his class on the world stage finishing tied fourth at the US Open and tied 10th at The Open. This becomes his 11th top-10 finishes in the Majors in the past five years. Adam earned automatic selection for the International Team at The Presidents Cup. Fellow Queenslander Jason Day has had a stellar year, achieving boyhood dreams and inspiring a nation. He teed off his season with a win at the Farmers Insurance Open before going on to notch up a further four victories. However by far the standout achievement of his year was claiming his first Major title, the PGA Championship as well as becoming the number one player in the world a goal he set as a 13 year-old. In addition to Day’s PGA Championship victory he finished T4 at The Open and T9 at the US Open and finished third on the FedEx Cup. He was also the highest ranked qualifier for the International Team at The Presidents Cup. New South Welshman Matt Jones had a consistent year competing on the PGA TOUR. He recorded four top-10 finishes this year which included two third place results. Matt achieved a year high ranking of 54th on the Official World Golf Rankings. Victorian Marc Leishman faced a tumultuous year in 2015, confronted by his wife’s unexpected life threatening illness he made the tough but ultimately right decision to miss the Masters Tournament to be by her side. A true family man, fans in Australia and the world were heartened by Marc’s family values and were cheering him on as he finished runner-up in a playoff at The Open. He finished 72nd on the FedEx Cup and achieved a year high ranking of 27th on the Official World Golf Rankings. He was also an automatic selection for the International Team at The Presidents Cup. Queenslander Steven Bowditch had one of his most consistent years on the PGA TOUR showing his prodigious talent each time he teed it up. He was rewarded with his second win on the world’s biggest tour at the AT&T Byron Nelson Classic and also finished 20th on the FedEx Cup, his best result since joining the Tour in 2011. Throughout the year he achieved a highest position of 54th in the Official World Golf Rankings. Nick Price recognised Steven’s outstanding year by selecting him as a Captains Pick for the International Team at The Presidents Cup. Queenslander Karrie Webb had a consistent year competing on the LPGA. She competed in all five Majors, making the cut in four with her best finish being a tied 7th at the KPMG Women’s PGA Championship. Karrie recorded a further two top-10 results this season and is the second highest ranked Australian in the Rolex Rankings. West Australian Minjee Lee has made a huge impact on the world stage in just her second year as a Professional. After finishing co-medalist at the LPGA’s Qualifying School to earn her card, she broke through for her first victory as a Professional at the Kingsmill Championship. In the best fields in the world she showed her genuine class as a player finishing top-15 in three Majors; the Women’s PGA Championship, Women’s British Open and the Evian Championship. We also witness a changing of the guard in Australian women’s Professional golf at the hands of Minjee who this year overtook Karrie Webb as the highest ranked Australian golfer in the world. New South Welshman Rebecca Artis enjoyed a successful season on the Ladies European Tour recording her second victory on the Tour at the Ladies Scottish Open and is currently ranked 126th in the Rolex Rankings. The Greg Norman Medal dinner will be held during the week of the Australian PGA Championship on Tuesday December 2nd at RACV Royal Pines Resort on the Gold Coast.